This article is a short summary of Fortune Street. Dragon Quest Wiki features a more in-depth article. 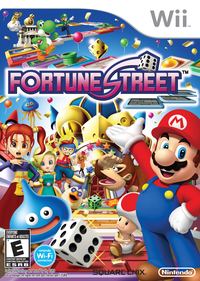 Fortune Street (Boom Street in Europe) is a Wii video game developed by Square Enix that crosses over the Dragon Quest and Super Mario franchises. The game is a follow-up to Itadaki Street DS which is a part of the Itadaki Street series. The game plays in a board format similar to Monopoly in concept, featuring boards based on famous locations from both series. Fortune Street is the first title in the Itadaki Street series to see a release outside of Japan. The game has four characters from either series traverse a board based a famous location with the goal of increasing their net worth to the given threshold or forcing the other players to become bankrupt. Players earn money by collecting their salary by collecting all four suits around the board and returning to the Bank square, other players landing on their properties, earning commissions off properties, and raising the stock price in districts they own stocks in. Each board is divided into districts with the smaller districts consisting of four properties. When a player owns another property in the same district, both properties increase in value by a factor with the factor growing with more properties in the same district owned. Players can also increase the price of they own by investing money when they land on one of their own properties. The investment is limited by the stock investment of the district it's in as well as its value. The players traverse the board by rolling a dice (which can go up to eight on the larger boards). Players can purchase properties at its stated price if its unowned or for five times its value if another player owns it. There are also event spaces like the venture spaces, which shows a 8x8 board of cards that have a variety of effects, both positive and negative. Around the board are four Suit squares that also function as venture spaces. After returning to the bank with all four suits, the player earns a salary based on the number of properties they own and the amount invested in stocks. This tends to be the main way to inject money into the game. Stocks can be purchased or sold at the Bank square or on a Stockbroker square; while players can only buy up to 99 stocks at one time, selling stocks does not have the same restriction. Usually, when buying 10 or more stocks, it raises the stock price in same district, with the reverse also being true. If a player lands on a property another player owns in a district, whoever owns stock in that district earns a up to 10% commission derived from the ratio of stocks owned by players in that district. Players can also play the game under the Easy Rules setting, which removes several of the game's more complex elements such as stocks, vacant lots, and districts. To increase the price of property, players must purchase properties in a row. This page was last edited on 22 September 2017, at 22:22.